UU’s Sylvia Hudson (right) looks to pass during Monday’s game at Concord (W. Va.). 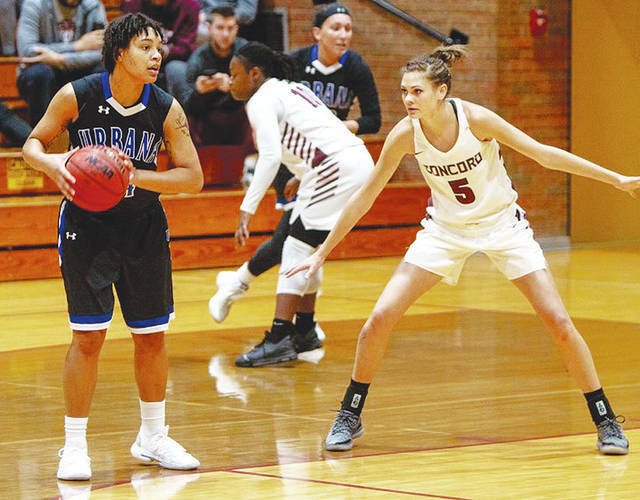 ATHENS, W. Va. – Sylvia Hudson scored 27 points to lead Urbana University back from an early 18-point deficit to force overtime at Concord on Monday. However, the host Mountain Lions came out victorious, 96-87, in MEC women’s basketball. UU drops to 0-3 (0-2 MEC) on the season while CU improves to 4-1, 2-0. Hudson finished 12 of 21 (57.1%) from the field and grabbed a team-high seven rebounds. The junior forward tied her career-high scoring total against a conference opponent, which also came at Concord during her freshman campaign. Blue Knight senior Megan Beachy scored 20 points while freshman Nikki Current tallied 15. Both guards knocked down three 3-pointers. UU trailed by as much as 18 in the first quarter after CU went 10 of 17 from the floor with three 3-pointers during the opening 10 minutes of action. In the second quarter, UU answered by closing an 11-5 run of its own over the final 3:16, capped by a Beachy 3-pointer and putback layup right before the buzzer. That sliced the 14-point deficit at the end of the first to only five at halftime. Later on, Hudson scored 13 consecutive points for UU in the fourth quarter and 25 points total in the second half. Her layup with 1:31 left in regulation tied the score at 80-80. However, CU stole the momentum right back with a three-point play on the next possession to go up 83-80. With 51 seconds left, Current came up clutch for the Blue Knights and drilled an open 3-pointer to tie the score again. UU got a stop on the final possession by preventing CU from getting a shot off, which forced the first overtime game of the season. Then, the Mountain Lions stormed ahead in overtime with a 10-0 run and outscored the Blue Knights 13-4. UU shot just 2 of 9 across the extra five minutes. CU shot 55 percent overall from the floor while UU knocked down 42 percent. The Blue Knights forced 15 turnovers while outscoring the Mountain Lions 17-10 in points off turnovers. UU turned it over only nine times. The Mountain Lions dominated the interior by posting a 52-38 scoring advantage in the paint. UU travels to Findlay for a non-conference game on Wednesday. Tipoff is slated for 5:30 p.m.
ATHENS, W. Va. – The UU men’s basketball team lost to Concord, 99-79, in MEC action on Monday. The Blue Knights (0-2, 0-1) trailed, 51-37, at the half. For UU, Matt Treacy had 22 points, Datrey Long had 21 and Malik Jacobs added 16. The Blue Knights were out-rebounded, 43-25. UU plays Purdue Northwest on Friday at 3 p.m. at the Tiffin Thanksgiving Tournament. https://www.urbanacitizen.com/wp-content/uploads/sites/36/2018/11/web1_uuhudson.jpegUU’s Sylvia Hudson (right) looks to pass during Monday’s game at Concord (W. Va.).